The Tula Explore Sleepy Dust is now available from Sling Spot! Tula’s Explore carrier offers a single carrier that will carry your baby from birth to toddlerhood, in three different widths, meaning no insert is needed, and three different positions, including front facing out, so baby can see the world the way you do. The panel height adjusts in two heights to ensure your baby’s back is supported (and later on to allow them to be arms out when they are old enough.) The fabric is soft and smooth to the touch. The straps are worn rucksack style and and the carrier can be used on the front facing in, facing out or the back (when baby is old and strong enough). Tula Explore Sleepy Dust… A sprinkle of Tula sleepy dust means restful rides in your carrier! “Sleepy Dust” is a stylish neutral design with off-white triangles sprinkled across a soft grey background. The pattern continues across the inner shell of the carrier, straps, waist belt and the detachable hood. As you welcome your baby to the world, the Explore carrier seamlessly adjusts and lets you hold them close from the very beginning. Therefore, simple and distinctly precious. Multiple positions to carry baby including front facing out, facing in, and back carry. Each position provides a natural and ergonomic position so it is best for comfortable carrying that promotes healthy hip and spine development for baby. Adjusts in three width settings to find a perfect fit as your baby grows from newborn to early toddlerhood. Responsibly designed and made with care from soft and breathable 100% cotton that’s easy to clean and machine washable. Padded shoulder straps provide ideal neck & shoulder comfort and offers quick adjustments for multiple wearers. Wide padded waistband helps evenly distribute weight. Padded leg openings to keep baby comfortable. Large pocket on the waistband to store necessities. Coordinating removable hood with snaps to support baby’s head while sleeping, sun protection while out and about, and extra privacy while feeding baby. If you would like to read more about facing out, Rosie has an article on the Carrying Matters website discussing this position. 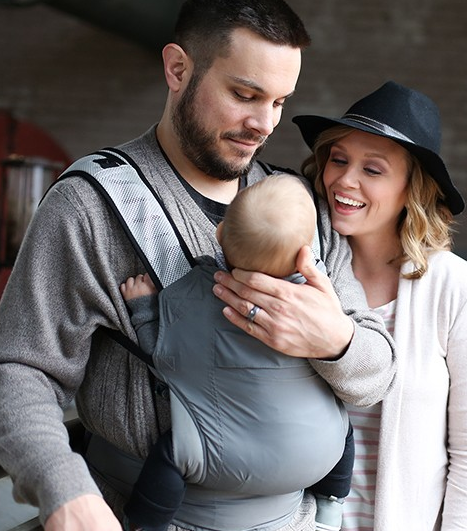 Before beginning to use your Tula Explore Carrier in the facing out position, your baby should have strong head and neck control and their chin should clear the top of the panel when facing out. This typically comes around 4-5 months. We also suggest the facing out position for shorter intervals of time for optimal comfort. Watch baby for signs of sleepiness or over-stimulation. Therefore, baby should not sleep in the front carry facing out position. When you want to back carry your child in your Tula Explore they should have strong and consistent head, neck, and torso control, and can push him or herself independently into, and remain in, a seated position on a consistent basis. Typically this is about six months or so. Depending on the snap setting, the seat panel width is adjustable from 13 – 38 cm/5″ – 15″. Depending on the neck pillow placement, the height of the panel is 34 cm/13.5″ tall when the pillow is snapped down and 43 cm/17″ when snapped up. An award-winning industry leader, Baby Tula is proud to offer beautiful, easy-to use, versatile, and long-lasting baby carriers which provide a comfortable, ergonomic method of supporting the bond between caregiver and child from birth through 4 years old and beyond. Tula Baby Carriers are available in a variety of prints, making them both useful and stylish! Baby Tula is proud to meet and exceed safety standards and norms, and is a business member of the Baby Carrier Industry Alliance (BCIA). You can find all other Tula designs we have in stock here.